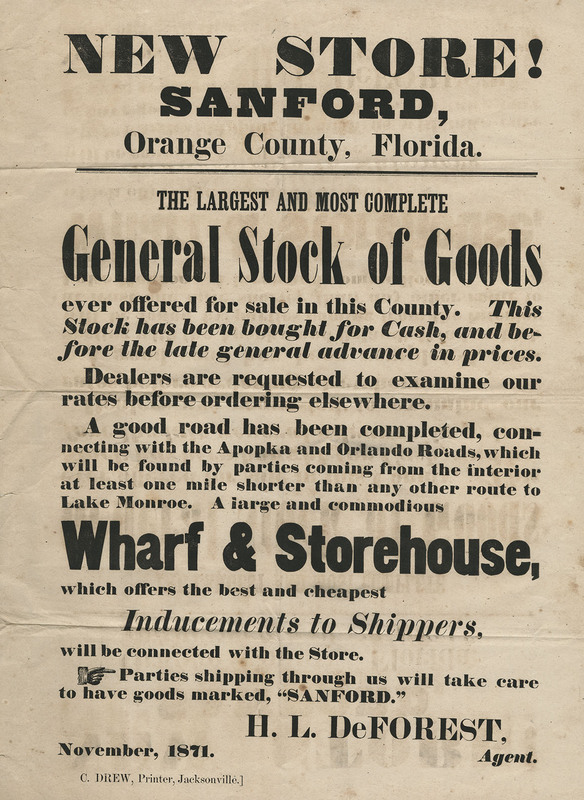 An advertisement from November 1871 for the opening of the general store in Sanford, Florida. The Sanford General Store was founded by Henry Shelton Sanford (1823-1891) in March 1871. The store was created with hopes of bolstering the success of the Sanford Sawmill, opened the prior year. The creation of the store was the result of advising offered to Sanford by Edwin G. Eastman. Eastman suggested that a general store would be the surest way to improve profitability of the ailing sawmill, as mill employees would be paid with goods from the store. The general store's initial years of operation were plagued by problems. The store suffered from periodic shortages of crucial supplies. Local farmers, faced with poor agricultural production, had a difficult time turning their produce into the cash needed to purchase goods. The only way Sanford proved able to ensure consistent sales was through the extension of credit to local settlers. This approach proved untenable, however, as impoverished customers proved unable to pay their debts to the store. In January of 1873, the store was owed $4,000 by delinquent customers, a number that ballooned to $25,000 by 1879. As Sanford's personal financial state suffered, maintaining the stock of groceries became increasingly difficult. 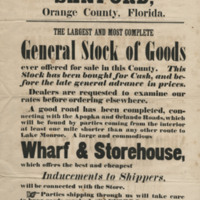 By March of 1879, Sanford was unable to continue the operation of the general store and decided to dispose of the remaining supplies and lease the building, alongside the wharf and its attached warehouse, for three years terms at $550 per year. Original advertisement: box 52, folder 1, subfolder 52.1.2, Henry Shelton Sanford Papers, General Henry S. Sanford Memorial Library, Sanford Museum, Sanford, Florida. Originally created by Henry L. DeForest. “New Store in Sanford!.” RICHES of Central Florida accessed April 22, 2019, https://richesmi.cah.ucf.edu/omeka/items/show/4732.